The girl is reported to have been “very lucky” after the man “nearly had her”. The road between Ferbane and Clonlyon, where the attempted abduction occurred on Tuesday. Image: via Google Street View. GARDAÍ ARE CONFIDENT of catching the man behind the attempted abduction of a girl in her early teens in Co Offaly on Tuesday. The Irish Sun reports that the girl is 13-years-old and that Gardaí say they are confident of identifying the man who tried to abduct her having obtained a partial van registration (05-D). They could make an arrest as early as today, according to the paper. 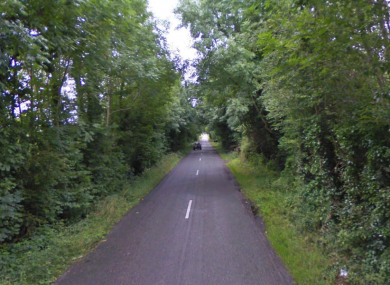 The incident occurred on a countryside lane near Ferbane in Co Offaly at around 8.30pm on Tuesday evening when the girl was out cycling to a friend’s house. The man, driving a white van, pulled up alongside her and engaged in conversation before trying to pull her into the back of the car. The girl was able to escape and the man drove off. Witnesses with any information are asked to contact Gardaí in Birr on 057 916 9710, the Garda confidential line at 1800 666 111, or any Garda station. Email “Gardaí confident of catching man behind attempted abduction in Offaly”. Feedback on “Gardaí confident of catching man behind attempted abduction in Offaly”.